Peel and chop potato’s into cubes. Boil potato’s for about 6-8 minutes or until they are mashable. Once they are done, mash them in the pot and put them to the side. Spray a small soup pot with oil of your choice and throw in chopped celery, peppers, corn and onion and cook for 5 minutes until soft. 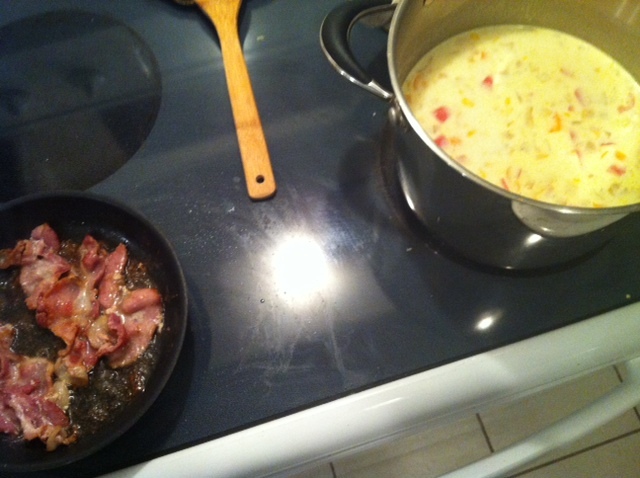 Pour in milk, potatoes and bacon and stir until potato until soup is creamy and thick. Throw in torn up bacon pieces and put your salt and pepper in for seasoning. Serve Immediately!